It’s something terrible we have all experienced. Accidentally eating a light pink, mealy, and flavorless tomato. Or perhaps eating a bland, completely tasteless melon. Or worse eating slices from an unripe slightly green banana. 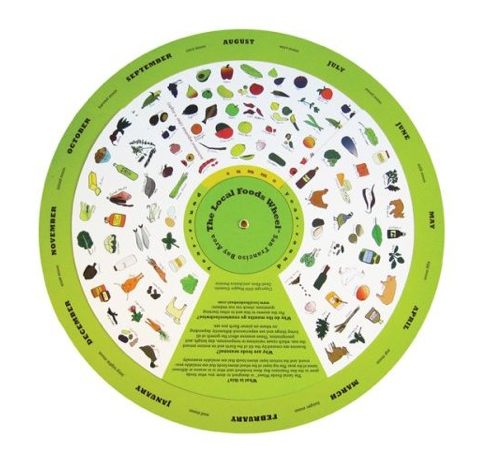 How do you ensure that you are eating the tastiest and most nutrient rich fruits and vegetables? 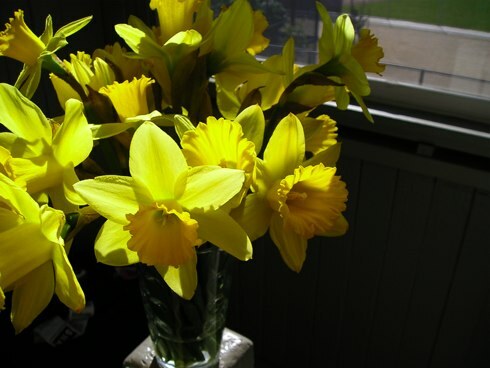 Start eating seasonally and locally! Portable for the tech crowd: the Seasons iPhone application will give you seasons information for “fruits, vegetables, lettuces, herbs, fungi and nuts,” for wherever you happen to be. You can view local seasons versus import seasons and see a graph that shows how “in season” a given food is. It’s $1.99, but you can take it everywhere! – River Cottage Vegetable Handbook – the River Cottage makes the best little handbooks on the planet. 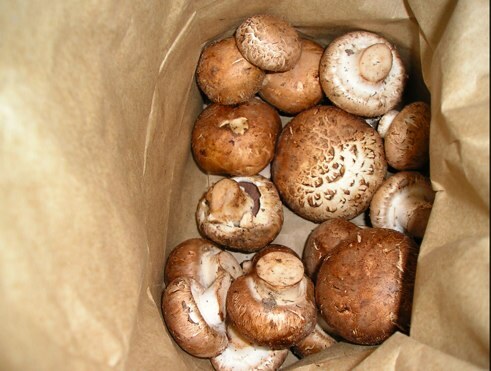 They have ones for mushrooms, preserving, bread making, and seafood as well. Summer squash is upon us at farmers market! And it’s cheap cheap cheap! I’ve been getting it for a dollar a pound or less, and using it baked, in salads raw, in soup, or just sliced thinly and sauteed with a little bit of olive oil, lemon juice, thyme, salt and pepper. Today I decided that I’d go for it baked with potatoes and cheese in a little gratin – enough substance for a main meal, served with a little fresh salad of tomatoes, roasted peppers, and fresh herbs. I’ve been trying to make a good amount of my meals vegetarian, and this combo was both tasty and quite satisfying, even for the omnivores. 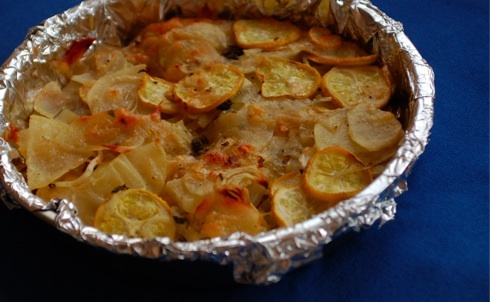 The trick to this gratin is slicing the potatoes and squash really thinly, so they cook up speedily and the whole dish is cooked through. And for the tomato salad, you want to use really ripe tomatoes, preferably heirloom tomatoes, that haven’t been refrigerated, otherwise you won’t have the burst of flavor that is so delicious in this salad. :: Preheat oven to 375 degrees. 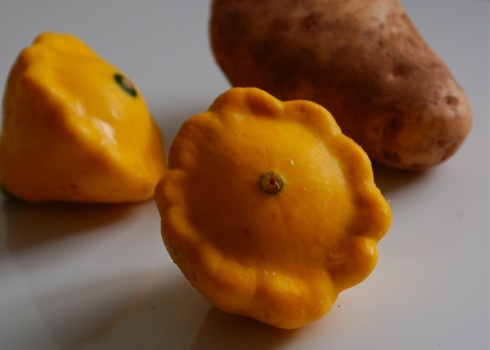 On a mandolin or with a peeler, very thinly slice a pattypan squash, a summer squash (or zucchini), and a russet potato into a medium bowl. You want to make sure your potato is paper thin, or else it won’t cook all the way through. Thinly slice a shallot, and add it to the mix. Coat mixture with several good glugs of tasty olive oil, add in a few sprigs of fresh thyme, a good pinch of Maldon or other coarse salt, some fresh black pepper, and a half a cup (or more) of freshly grated Parmesan cheese. Toss well, and somewhat evenly layer into an 8-inch cake pan, lined with foil, cover with another layer of foil, and bake for about 40 minutes. Take the foil cover off, and bake an additional 15-20 minutes until top is slightly browned and crispy. 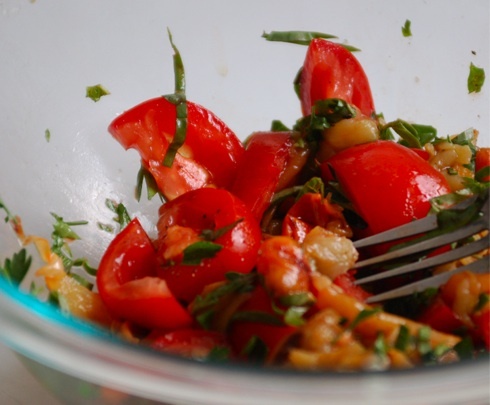 :: In a bowl, slice a few really good heirloom tomatoes, about a cup of roasted red peppers, and a good handful of chopped basil, parsley, and mint. Dress with a simple balsamic vinaigrette – one part balsamic to about three parts olive oil, and a dash of salt and pepper. You can add some green lettuce, optionally. 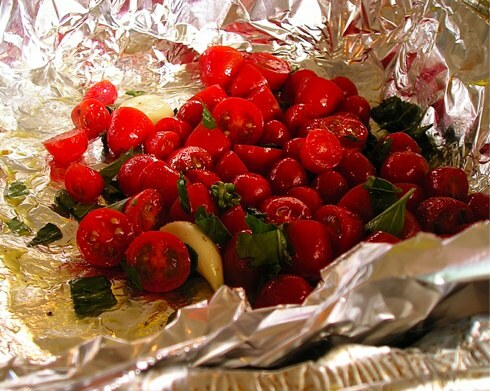 If you don’t have roasted peppers – make some – preheat the oven to 400, and pop the peppers onto a foil lined baking sheet, turning every 10 minutes or so until they have charred slightly on the outside. Let ’em sit for ten minutes or so until they are cool enough to peel, then peel, and remove the inner seeds and the stem. If you still don’t have peppers – just add a few more tomatoes, and maybe a few cubes of fresh bread if you want. Almost like panzanella. That’s about it. OH MAN IT IS STRAWBERRY TIME! 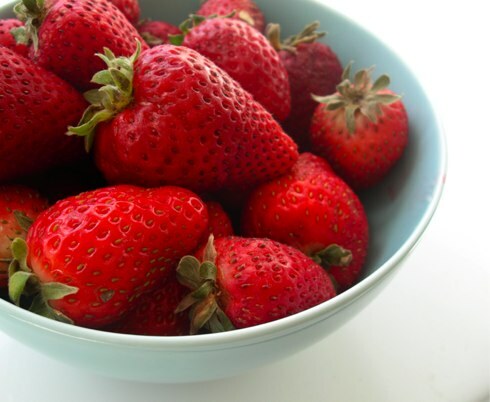 There is nothing like the beginning of strawberry season, my favorite time of year, when these red joyous fruits come out in their full splendor, bursting with flavor. There is nothing like a fresh ripe strawberry, radically different from it’s tasteless sibling, the out of season supermarket variety. I bought my first strawberries last week at the farmers market, after one week of browsing but holding back when they first popped up last Saturday, and then only after sampling from several vendors this week (you can’t just settle on the first ones you see). 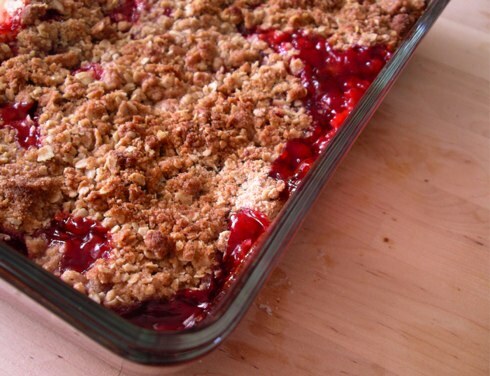 I ended up with the beauties that are in this crumble recipe. Can you over do it on strawberries? I think not. In the next few weeks I will be making crumbles, tarts, cakes and jam with these guys, fully taking advantage of their shining moment. Most of all I’ll just eat them copiously in my favorite preparation: strawberries with a little bit of brown sugar and cream. 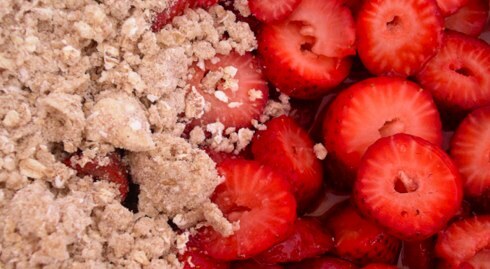 One of the most delicious ways to use some extra strawberries is as the co-starring role in the ever versatile Crumble, which features most any fruit you want to use nestled under a most excellent topping of flour, oats, butter and brown sugar. After recently re-reading Barbara Kingsolver’s year long family adventure “Animal, Vegetable, Miracle” about eating locally from her own farm and neighborhood, I decided to try out her crumble recipe, which boasted a short list of ingredients, all of which I had in the kitchen when I decided to make this on a whim. In her version, the fruit is sweetened with honey- a preparation I was eager to try with my very tasty Alfalfa honey from Eggman Family Farm. If you haven’t had a chance to read her inquisitive, informative and very entertaining book, I’d definitely pick it up at the library. This dish is perfect for a summer evening, a picnic, and especially to share with friends. 1. Heat the oven to 350° F.
2. Prepare filling: Mix the halved strawberries and the honey in an 8×8 ungreased pan, (or a 9 inch deep pie plate), and set aside. 3. Prepare topping: Mix all the ingredients with your fingers until crumbly, sprinkle over fruit mixture and bake at 350° for about 35 to 40 minutes, until golden brown and the fruit is bubbling out everywhere. 4. Serve warm, with a dollop of ice cream, or a little bit of cream. It tastes wonderful after dinner or lunch for dessert, but equally good reheated in the morning as breakfast. **Don’t have strawberries? This tastes great with peaches, apples, pears, berries, or in combination of any of these. You can also add some more fruit if you have any on hand – a cup or two more fruit won’t ruin the recipe. Growing up, one of my favorite foods from my mother’s kitchen was the Dolma. Dolma in Turkish really refers to pretty much anything stuffed, rather than just the stuffed grape leaves it has become synonymous with in the States. Some of my favorite dolma were her stuffed tomatoes, peppers and zucchini: vegetables from our garden ubiquitous in the summer time, that truly sang with a little bit of added filling. At home, my mother would make them with a traditional Turkish style filling of ground meat, rice, onion, chopped tomato, mint, dill, parsley, and toasted pine nuts. After finding some spectacular peppers, and some Kokuho Rose brown rice this week at Alemany farmer’s market, I set about gathering ingredients for my dolma. I already had some left over cooked ground turkey that I had sauteed for a frittata filling that needed to be used up, and stuffed peppers seemed to be a natural receptacle for using up my leftovers. 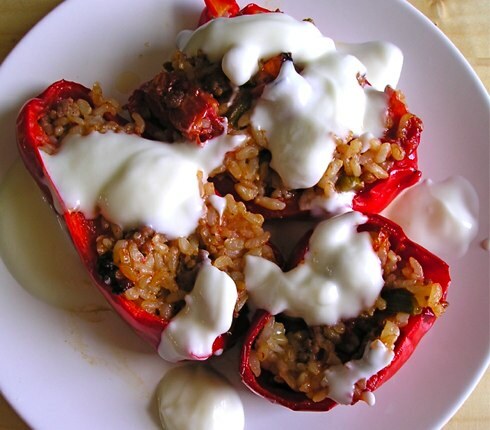 While these stuffed peppers don’t follow the traditional recipe, they are still incredibly delicious, and bring back so many good memories of home and excitement for the summer to come. 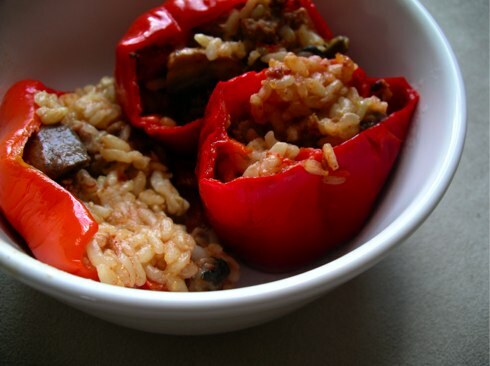 The best part about these stuffed peppers is that you can make them well in advance, and they taste equally good, if not better, the next day for lunch. And, they are the perfect size to pop two into a bento and have a filling lunch at work. Finally, in the spirit of adding as many vegetables to my diet as possible, I decided to add some roasted cherry tomatoes to the filling, and pop in a few extra scored tomatoes into the final dish to roast alongside my peppers. If you have any extra vegetables that need some cooking, this isn’t a bad dish to pop them in alongside. 1. While brown rice is cooking, pop a few handfuls of cherry tomatoes in a pan with some olive oil, garlic cloves, salt, pepper, and freshly torn basil. Cook at about 300 degrees F, until the rice is done, about 40 minutes. They should get all jammy and delicious. 2. Right after popping the tomatoes in the oven, start the ground turkey, first sauteeing a half an onion in a little bit of olive oil for about 15 minutes until soft, and then adding the ground turkey, and cooking until well browned. Season with salt, pepper, cumin, and chili powder to taste. (I usually use about a teaspoon each of cumin and chile powder, but I like these with a little kick. 3. When the rice, tomatoes, and turkey are done, stir together in a bowl, and add a good glug of balsamic vinegar, and a few teaspoons of fresh thyme and oregano. 4. Preheat the oven to 400 degrees Fahrenheit. Line a deep baking tray or roasting tray with foil, and grease lightly. 5. Cut the peppers lengthwise, leaving the stem in place, but scooping out any seeds and excess white bits. For smaller peppers, feel free to lop off the top instead of cutting lengthwise. My mother bakes her peppers with the tops on, but I personally enjoy how the filling gets crisp on top when left uncovered. In a large baking pan lined with foil, place the peppers, season with a little salt, and pour on a little bit of olive oil. Say hello my new little herb garden! 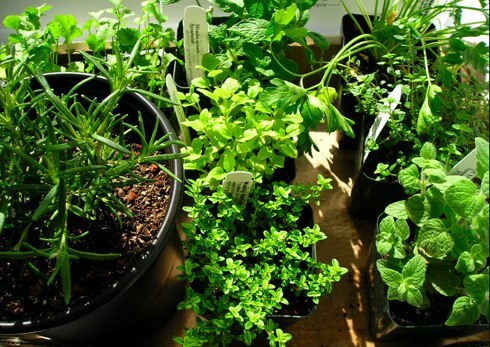 Rosemary, Cilantro, Parsley, Mint, Thyme, Oregano, Marjoram, oh my! I live in a third floor apartment, so its current home is on my washing machine, although I try to move them during the day to where the sun is (when I’m not lazy) . So far they have been doing really well, and if I manage not to kill them, I’ll start adding some more to my collection. Having fresh herbs on hand not only brings greenery into this little apartment, but makes a world of difference in my cooking. Everything tastes about 15 times better, I swear. An affair, of sorts. For the past several months I’ve been frequenting my local farmers market in Noe Valley, just a fifteen minute walk from my house. I can’t adequately express how wonderful it is having fresh produce just a few minutes away, and at prices that are considerably cheaper than the supermarket. Saturday, (feeling a little bit unfaithful to my neighborhood market) I decided to make the five minute drive to Alemany Farmers Market, to “assess the competition”. Man, oh man. Not only was the market cheaper, but it had so many more options! I have found my farmers market. Entering the farmers market, I spent a dollar on an amuse bouche from one of the local vendors, a lemon poppyseed muffin and a dixie cup full of hot chai. Keeping to a relatively small budget of $25, my purchases included, Eggman Family alfalfa honey ($2.75) , two big bunches of asparagus ($4), a bunch of fragrant thai basil ($1), about 10 ripe tomatoes ($3.00), with a jalapeno added for good measure (free), three large daikon ($1), four red bell peppers ($2), a couple of pounds of carrots ($1.20), and some brown mushrooms, and oyster mushrooms from Far West Fungi ($5.00). The most I spent at any vendor was $4.50, on a pound and a half of Kokuho Rose brown rice from Koda farms, which, although it was harvested last fall (California has one legal harvest season), is probably fresher than most of the rice found on the market here. I’m looking forward to trying it. Had I wanted, I could have taken a few extra dollars for lunch, as the lines for the Taco stand, Pan-O-Rama bakery, and the Hummus guy were all bustling full of excited people in the know. Well, there is always next week… and the week after that… and the one after that.. Alemany, I’m sold. The one flaw of Alemany are the lines for parking and exiting the parking lot. With no immediate place to go after my shopping, I found that this became a non-issue as I rolled down the windows, listened to some country music, and proceeded to wait patiently eating a fresh carrot. Ah, the life! 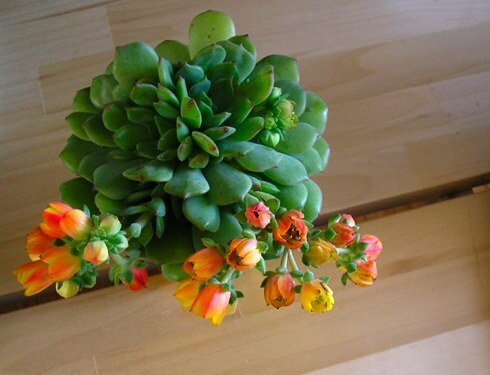 And here, for good measure, is a picture of my newest housemate, a little Echeveria (Hens and Chicks) succulent to brighten up the day! I got him at Trader Joe’s.